Andrew Flintoff was nearly caught by his dad on the second day of the second Test against West Indies at Edgbaston. Flintoff launched a mighty six into the stands as he neared his century and unerringly picked out his dad - who promptly spilled the ball. "I should have caught it," admitted Colin Flintoff, who still plays club cricket near Preston in Lancashire. "I saw it coming all the way, but it bounced out of my hand and ended up in the lap of Michael Vaughan's mum." He added: "I went for it with my left hand but didn't get my right hand on top of it in time. "With it being Andrew I should have realised how hard it was going but I didn't. "I could tell from his reaction that Andrew knew he had picked me out - I suppose if I'd taken it he'd have been the first Test batsman to be caught out by his dad!" 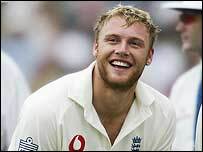 After watching his dad fumble the ball Flintoff broke into a huge grin and he joked about it as he walked off for lunch. The Lancashire all-rounder said: "I picked my dad out with one of the sixes. "He plays at the weekend and comes home every week telling me what a great catch he has taken. "But I think he has now proved to everyone that he is terrible! I thought he was going to come over the balcony at one stage. "He got all excited and he put it down, didn't he? I'll have a go at him later!" Flintoff was eventually out lbw to Omari Banks for 167, a Test best, and managed seven sixes along the way.